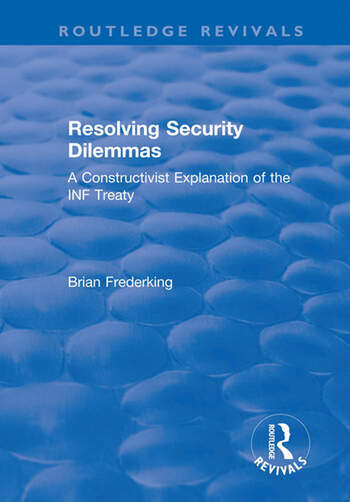 This title was first published 2000: The book applies constructivist arguments about culture, norms and identity to explain the superpower negotiations that produced the INF Treaty. It contributes to the constructivist research program in two ways. First, it develops a speech act model of social interaction to illustrate constructivist arguments and second, it develops a constructivist theory of security dilemmas that suggests practical ways to resolve them. The substantive conclusion of the book is that the dominant understanding of the end of the Cold War (the buildup argument) is not correct as it advocates policies that tend to perpetuate conflicts. Instead this book argues that the 'new thinking' explanation is more coherent and suggests improved practical ways to resolve other security dilemmas.